Pele*s Hair and Pele*s Tears are two unusual types of lava found at Kilauea and other volcanoes. Gemstones - Colorful images and articles about diamonds and colored stones. Volcanoes - Articles about volcanoes, volcanic hazards and eruptions past and present. Ruby and Sapphire are the 2nd and 3rd most popular colored stones in the United States. Turquoise - A bluish green gem material that has been used for over 6000 years. Crushed Stone - About four tons per person is used each year in the United States. Petrified Wood is a fossil that forms when silica replaces and infills the cavities of wood. 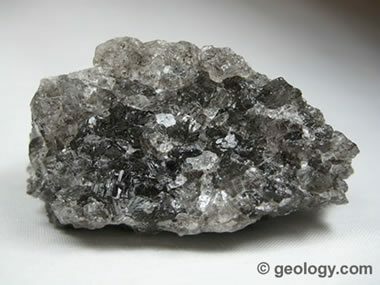 Rock Salt: The specimen shown is about two inches (five centimeters) across.